Living for glory kinda went out with dying by the sword: there just isn’t much of it in the daily struggle to work a desk job, handle your homework or get your kids in bed on time. Sword & Glory (Free) is an outstanding game that imagines a time when life was all about the struggle to raise yourself and your family for nothing, earn a reputation for great deeds and pass that down through generations. The life you live may always start the same—the same small homestead, the same brotherly advice— but you have a few key decisions to make before you begin. You can pick a clan, align yourself with the hardy Elk Clan, the noble Eagle Clan or the traditional Bear Clan. Or you can shove the whole clan system and go it alone. Similarly, you can dedicate yourself to a faith or go for a more worldly approach. Finally you define a personality trait for yourself. Those choices directly impact the life you’ll lead—the kinds of quests you’ll encounter, the opportunities that will arise and the ways you’ll excel in combat. From those humble beginnings you head off to build a life. At first you’ll probably focus on helping your family and clan, driving off competition for resources, hunting down petty thieves, and otherwise protecting your homestead. Maybe you’ll get married. Maybe you’ll range far from home. Many decisions come down to a binary choice: do violence, or don’t. Violence isn’t always the best option, but it is usually the fastest route to glory (score, more or less), Epic points and silver. With those things you can improve your lot in life, so while you may want to pick your battles, you’ll have to do some fighting. 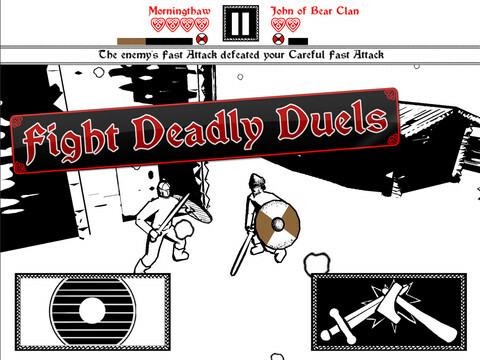 Fighting comes down to a fairly simple duel system. You face off against a foe with a sword and shield. You have buttons for the same. Combinations of tapping and holding give you shield bashes, blocks, and careful, fast or power attacks. There’s a rock-paper-scissors calculation going on in the background, and with that and careful timing you can destroy your foes. With a few successful bouts under your belt, life opens up. You can expand your home, improving your stats in the process. You can buy new gear that gets passed down to your future characters. You can use your Epic points to unlock truly impressive items. And you can range farther afield, encountering new adventures and new challenges. Wounds are easily dealt with at the cost of some of your hard earned Epic points, but eventually you’ll take too many hits in a single fight and die. Even if you’re a flawless warrior, death gets us all in the end. When that happens, your character is given a title for his sacrifice and a place in the graveyard. Your glory is marked on the leaderboard, your silver is lost, your points and gear go onto the next generation, and you start again anew. It’s a fantastic arrangement, well thought out from almost every angle. The most confusing part is that Sword & Glory is currently completely free. It seems as though room was left in its design for in-app purchases of Epic points, but those haven’t materialized. You have to earn every bit of future success for yourself, and there is no cost but the effort you’re willing to put in. Sure, the art style might be a touch divisive (stark whites as far as the eye can see) and the game sometimes suffers from clumsy writing, but there’s really no reason not to try it out. 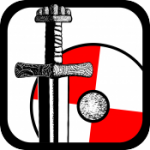 Sword & Glory delivers what it promises: glory to be had, and life and death by the sword.